Little Bill and the Blue Notes are an institution more than a band. Since 1956 Bill and various lineups have been wowing audiences with their take on rhythm and blues. In 1959 the Bluenotes made the national charts with the teenage love song “I Love an Angel” and since then have released a bevy of recordings. 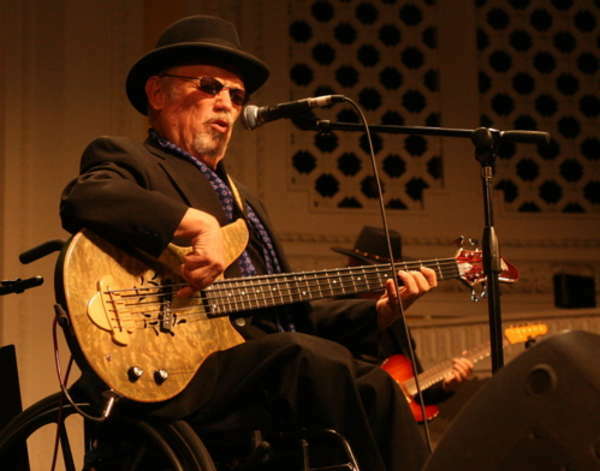 In 2010, Little Bill was honored with the release of “Big Blues for Little Bill” – a compilation of his songs redone by NW artists such as Duffy Bishop, Billy Stoops and Polly O’Keary. The disc coincided with Bill’s 70th birthday with shows at the Triple Door and the Rialto Theatre. All proceeds from the sales of the cd went to the Dystonia Medical Research Foundation – a cause that is near to Bill’s heart. Over the years, Engelhart has had the pleasure of working with some of the finest musicians in the northwest including Jo Johanson, Isaac Scott and Buck England. In addition, he has opened for legendary acts such as BB King, Robert Lockwood Jr. and Buddy Guy. The singer, songwriter and bass player has a roomful of awards including NW Hall of Fame, the W.C. Handy Award and the BB Life Time Achievement Award. His current lineup consist of master guitarist Billy ‘Stapes’ Stapleton and the tight and steady multiple award winning Billy Barner on the drums.